The moves by NHS trusts in England to set up subsidiaries and avoid paying tax are creating a scenario that could lead to a Pandora’s box of Carillion-type meltdowns, with the adverse knock-on effect of job losses and salami slicing of service provision. Unite is concerned that the trusts are forming these wholly owned subsidiary companies so that they can register for VAT exemption and compete on a level-playing field with commercial competitors who register for VAT exemption for their work in the NHS, when NHS trusts can’t. Unite, which has 100,000 members in the health service, wants HMRC to close this loophole, but this request has, so far, been rebuffed by the Treasury. The latest manifestation of this trend is at the Wrightington, Wigan and Leigh NHS Foundation Trust, where the dispute concerning outsourcing has led to strike action. The row further escalated last month when the trust board decided to push ahead with the formation of WWL Solutions, a wholly owned subsidiary that will see estates and procurement staff being TUPE’d – the Transfer of Undertakings (Protection of Employment) regulations – from the trust on 1st August. These loyal and dedicated workers – electricians, plumbers, fitters, porters and cleaners – undertake a crucial role in keeping hospitals open and properly functioning. They are a core part of the NHS family and their jobs should not be hived off. We are not prepared to allow the jobs of our members to be sold off, which will inevitably lead to job cuts and attacks on the terms and conditions further down the line. There is no good reason for the NHS trust to be embarking on this course of action. Currently, Unite is examining whether this flawed and ill-thought out decision is open to legal challenge. The trust argues that this decision has been forced on it by the need to find £14.5m in savings or by generating extra income. But Unite counters that by constructive dialogue with the unions, the trust management don’t have to go down the subsidiary route. Unfortunately, this is a growing and pernicious trend with about 40 of these entities announced or already up-and-running in England – and many out-patient pharmacies in hospitals have gone the same way. Unite wrote recently to the health and social care secretary Jeremy Hunt calling for an immediate moratorium on further private limited companies being established by NHS trusts in England. The letter said: “We have been advised of situations from Yeovil to Gateshead that the purpose for NHS trusts establishing a wholly owned subsidiary company was so that it could register for VAT exemption and thereby compete on a level playing field with commercial competitors. However, the minister’s reply failed to address these legitimate concerns. We believe this could be creating a Pandora’s box of dozens of Carillion-type meltdowns among NHS trusts in England, which would have a detrimental effect on key health services and the employees that provide these services. What is happening in Wigan is symptomatic of a wider agenda of privatisation and fragmentation that has bedevilled the health service in recent years. The source of this ideology is the discredited 2012 Health and Social Care Act that reinforced the tendering out of contracts, which has turned out to be an open sesame for profit-hungry private healthcare companies keen to gobble up lucrative contracts leaving a trail of chaos, fragmentation and confusion in its wake. We are in Russian doll territory where each ‘doll’ reveals a new affront to the founding ideals of the NHS celebrating its 70th birthday this week. The NHS’s core problem is lack of funding to keep pace with an ageing population and fast-moving medical innovation. This is not a problem that can be solved by privatisation, but only by a substantial and sustained increase in funding. Theresa May’s recent announcement that the NHS in England is to get an extra £20bn a year by 2023 is the bare minimum required. Our members at the Wrightington, Wigan and Leigh Trust are in the forefront of a much wider policy struggle over the future direction of the NHS – and that’s why this is a campaign worth fighting and why we will be giving maximum support to our members in the weeks ahead so this wasteful, objectionable and short-sighted proposal goes no further. 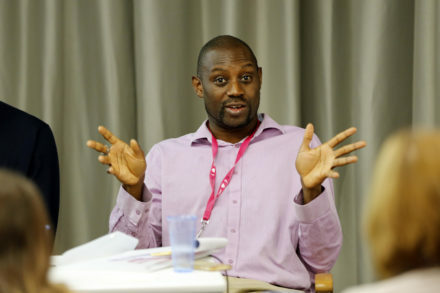 Colenzo Jarrett-Thorpe is Unite national officer for health.